The giant rocket NASA is building to carry astronauts to Mars and other destinations in deep space may cost $500 million per launch when it's flying regularly, space agency officials said Tuesday (Sept. 11). 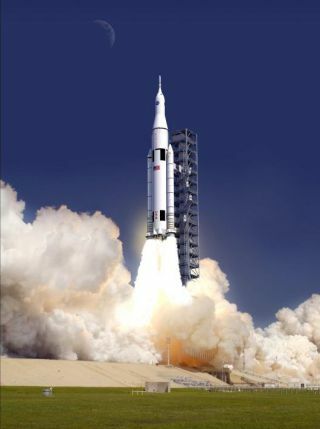 NASA is eyeing $500 million as a target right now for the Space Launch System (SLS) when it begins making roughly one flight per year, which could begin happening after 2023. But things could change as the SLS program — which was just announced in September 2011 — matures, officials said. "We've estimated somewhere around the $500 million number is what an average cost per flight is," SLS deputy project manager Jody Singer, of NASA's Marshall Space Flight Center in Huntsville, Ala., said Tuesday during a presentation at the American Institute of Aeronautics and Astronautics’ SPACE 2012 conference in Pasadena, Calif.
NASA unveiled the SLS just two months after the last flight of its venerable space shuttle program, which was grounded in July 2011 after 30 years of orbital service. But the giant rocket and the capsule it will loft — known as the Orion Multi-Purpose Crew Vehicle — are not a replacement for the space shuttle. That space-taxi role will be filled by private American spaceships, which NASA is grooming to be ready to carry astronauts to and from low-Earth orbit by 2017. The SLS-Orion combo, on the other hand, is a deep space transportation system. In 2010, President Barack Obama charged NASA with getting astronauts to a near-Earth asteroid by 2025 and then on to the vicinity of Mars by the mid-2030s, and SLS-Orion is how NASA will try to make that happen. The first test flight of the SLS is slated for 2017, and NASA hopes the rocket will begin lofting astronauts in 2021. If the SLS is able to meet the $500 million target, it would end up being cheaper to fly than the space shuttle. The shuttle program cost about $209 billion (in 2010 dollars) over its lifetime and made a total of 135 flights, yielding an average cost per launch of more than $1.5 billion. In its initial incarnation, the SLS will be capable of lifting 70 metric tons of payload. But NASA eventually plans to build several variants of the rocket, allowing it to carry 105 tons in one configuration and 130 tons in another. "We can move from one configuration to the other configuration with not a lot of cost," Bill Gerstenmaier, NASA's associate administrator for human exploration and operations, said Tuesday at the SPACE 2012 conference. "It's clear for the Mars missions that we talk about, we're going to need the 130 metric ton capability," Gerstenmaier added. "For a lot of other missions — from the science missions, et cetera — they can really be supported well with the 105 metric ton capability rocket." NASA is also aiming to launch the SLS-Orion combo two or three times per year eventually, Gerstenmaier said. That rate should be sufficient to take care of the agency's human spaceflight business beyond Earth orbit, and it will help keep costs down. "We don't want to build a huge infrastructure that supprts a very high flight rate — then it'd cost us a lot if we're at substantially less than that flight rate," Gerstenmaier said.